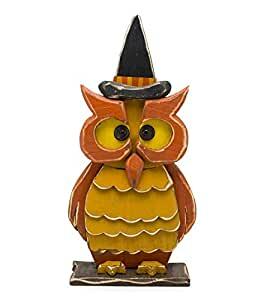 Our Halloween Wooden Owl with Witch Hat Statue adds some whimsy to your Halloween or autumn decor. The owl is carved from wood and features lots of charming details, such as a witchâs hat with striped ribbon, exaggerated eyebrows, inset eyes and a wavy, feathered belly. This owl accent has a flat base making it easier to show off on a mantel, windowsill or porch. For longest life, use in a covered outdoor area. Size: 11″W x 4Â¼”D x 21″H.